I have an office job and crave a creative outlet. So I started sewing! 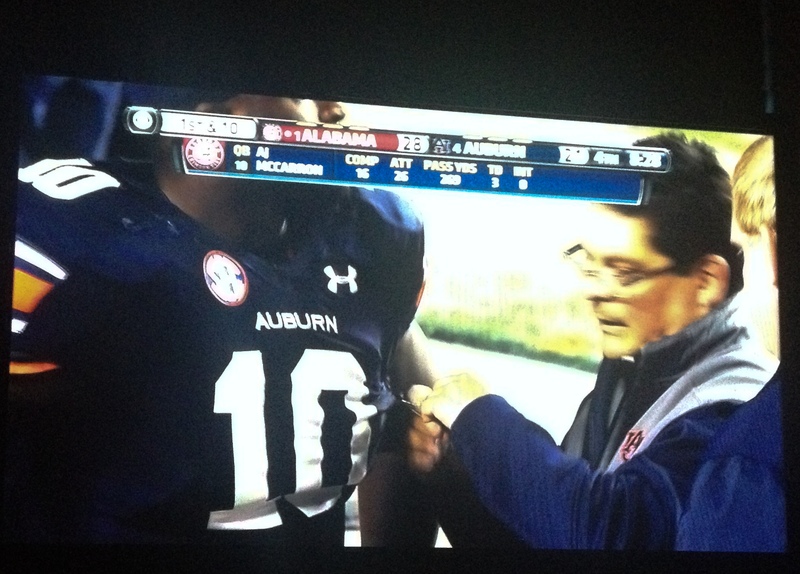 To my surprise watching College Football on Saturday, Auburn vs Alabama, the Auburn Equipment Manager pulled out a sewing machine part way through the game! I snapped a few photos of the tv. His name is Dana Marquez. 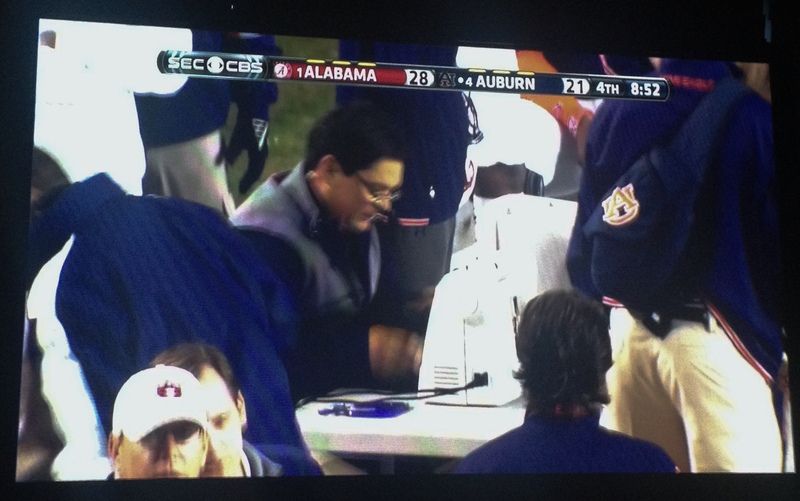 It was awesome to see a dude sewing in front of the entire college football audience. Then he hand stitched once the jersey was back on the player. Sewing on tv in prime time! I’ve been working away on my Vogue 8875 polka dot dress. Completed the bodice. Yikes. It’s a little tight. Hoping once the skirt and zipper are in it will look okay. The bodice is supposed to be loose-fitting but, umm, it will be fitted. Or I may have to squeeze on a little shape wear. Anyway, I’m looking at my sewing goals for 2013 and looking to 2014. I still haven’t sewn trousers as I resolved. Though I did complete my sewing dare. Giving away from my sewing stash AND sewing something from my stash. I’ve also updated my links on the right side of my blog and added some completed projects. You know, blog housekeeping stuff. I also have some sewing plans for my week off in December. I have a couple of appearances to make but also have big chunks of time to spend stitching. Can’t wait! Here’s a treat. Pantone’s 2014 colours for spring. Dazzling Blue is their colour of the year for 2014. Maybe it’s time to stitch up that blue lace like I’ve been threatening. I saw that game too – and I was in shock. I thought they were kidding when I first heard them mention the sewing machine. But how cool! I had to google the guy. The fact that he didn’t sew it in the locker room but set it up for the world to see. I’m actually quite excited about sand and cayenne…..that sounds weird. That’s so great about the guy sewing and showing the world that’s you can still be a tuff footballer and sew as well 🙂 Quite liking the colour tones for 2014, I’m sure they’ll bring out some nice new fabrics we can add to our stash to sew with these. Lucky you have plenty of sewing time over the holiday period. I’m wishing now we weren’t going on holidays as I think I wold have loved a couple of weeks in the sewing room.